A companion research guide to the department of Humanities & Social Sciences. You can access our InterLibrary Loan page at http://libguides.library.clarkson.edu/home/ill. The first time you visit this page you will be accessed to register. If you have a citation, you can request an item through that link by clicking the correct format under "new request." Put in the citation information and click "submit request" and we will try to get the item for you! You can also check your outstanding requests through this link. 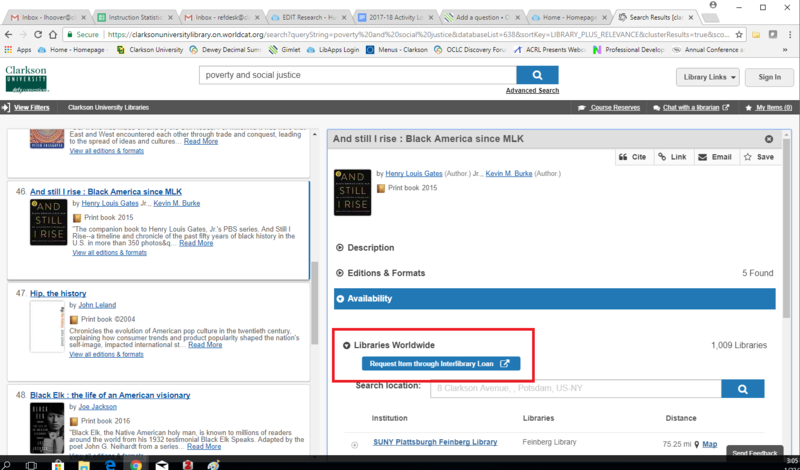 If you are searching through our homepage, you can request an item directly through the results by clicking the blue "Request Item through Interlibrary Loan" button in the item record. This will automatically fill in the form for you, and you can just submit.